These injuries, whether short- or long-term, can be very frustrating for those of us who are keen sportsmen or women. Even if you’re more of a casual, weekly gym-goer than an Olympic athlete, a trauma that takes you out of action can make you feel agitated and impatient to get back to full strength. Injuries take time to heal, and you can’t rush the process. Having said that, there are a number of steps you can take to ensure you’re optimizing your recovery. There are a wide range of different injuries with varying levels of severity, so please make sure you speak to your doctor before attempting anything new. 1. Follow the doctor’s orders. Chances are, your doctor will have suggested some form of rehabilitative exercise or aftercare. Medication is one option. If your doctor prescribes medication to deal with your injury, make sure you understand the best way to take the pills and make sure you finish the course. Physical Therapy is another common treatment. Make sure you go to the sessions, participate in and complete any ‘homework’ exercises you’re given. 2. Practice self-care, and understand the psychological impact of injury. Be kind to yourself. If you’re a sports addict, missing even one regular session can have a destructive effect on your mental health, and being on the bench for longer could lead to a slippery slope of agitation and sadness. If you’re a longtime martial artist, chances are your art is not only part of your exercise regimen, but also your social life, and even your identity. Missing out on training can feel like missing a piece of yourself. Don’t be too hard on yourself. Acknowledge that you might feel down, and that it might take a while to get back to your full strength. Meet up with your friends outside of a dojo setting, and focus on other activities that make you feel happy. Take up new hobbies, start that TV show you’ve been wanting to watch, or visit family you don’t usually get around to seeing. 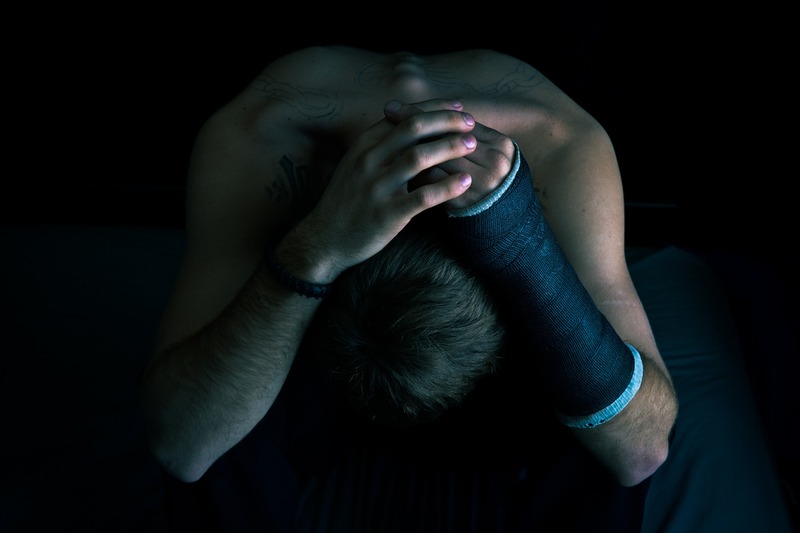 You can read more about the mental impact of injury here. Harvard Medical school stresses that the threat and reality of injury shouldn’t be an excuse to become sofa-bound. Sure, you will need to rest and take it easy while you heal, but that doesn’t mean you can’t stay as active as possible. Discuss options for gentle exercises with your doctor, and do what you can to work the muscles that aren’t injured. For example, if you have a sprained ankle, you could still try some moderate upper body exercises to stay active. It will benefit you mentally as well as physically. Depending on the type and severity of your injury, you may be able to keep training at a slower pace. Most schools, instructors, and fellow students are accommodating: for example, if you have a sprained elbow and train BJJ, you could let your partner know in advance and do a light flow roll. If you train muay thai and have a foot injury, you could focus on working elbows and punches. 4. Don’t fall victim to comfort food. A sad fact of life is that most of us (with a few lucky exceptions!) can’t eat what we want without exercising. If you’ve been eating the amount required to maintain an intense training schedule, you’ll need to adjust your diet if you become injured. It could be as simple as cutting back on protein shakes, or it could mean an overall reduction in food intake. Overeating can lead to deeper issues such as low self-esteem or even physical problems, so make sure you adapt your diet as much as you can, and eat healthily to keep your spirits up. Maintaining a healthy weigh and balanced nutritional intake while you’re injured will also facilitate a smoother return to training. 5. Gradually return to full steam. The time will come when you’re finally ready to ease yourself back into training. Make sure you follow any advice your doctor or physical therapist gives you, and take it slow. Don’t push yourself too hard, too soon, or try to push through any lingering pain. This could exacerbate your symptoms and take you out of the game for even longer. As you get up and running again, you may notice that you’re more hesitant to go at your former level, as you fear a repeat injury. This is totally normal, just give yourself time. If it persists, or if you’re plagued with worry about your performance when you return, it might be worth seeing a therapist to learn how to push through these fears. The main thing to remember is that there are other options, even if you suffer an injury that leaves you on the bench for several months. Above all else, keep a constant dialogue with your doctor, keep an eye on your mood and make sure you still stay as active as possible, and you will get through it. Lauren is an avid fitness fanatic, keeping up to date with the latest workout regimes and ways to keep herself at the top of her game. As someone who has seen and experienced every fitness injury and cliché possible, she endeavors to advise and help others to keep themselves both in top shape, healthy and happy.